Welcome to the home page of the Lifesize app. The home page gives you easy access to just about everything you need. Front and center, you have two options to either make a call or schedule a call for later. On the right side of the home screen, you'll find an activity feed of recently attended meetings and missed calls. Hovering over the activity gives you options to make a call either with or without your camera or to send a chat. Under the activity feed you'll find your favorites list. You can easily add favorites with the "add" button as well as make a call or start a chat by hovering over a contact name. At the top of the window you always have access to the global search. Just start typing, and your search will automatically pull up contact matches. You can also access your user settings by clicking your avatar to set your status and modify account settings for your microphone, camera, audio and language preferences. And if you ever need help, just click the little question mark for guided tutorials and to search help documentation. 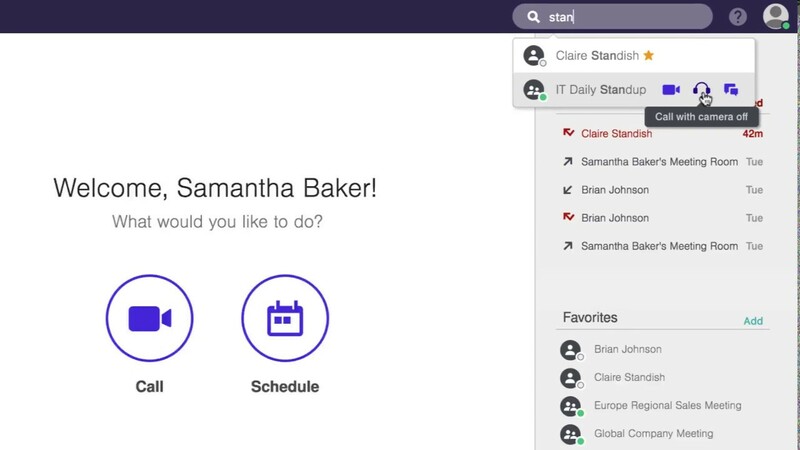 On the left side of the screen you'll find navigation for your chat history as well as directories broken down by user contacts, meeting room systems and virtual meeting rooms. Last, if you have Lifesize Record and Share enabled, you'll see a button in the lower right corner to view your video recordings. Check out the how-to section of our resources center for more user tutorials.